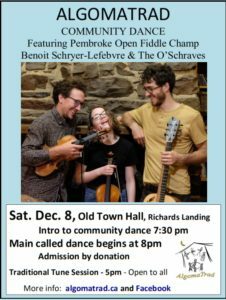 Holiday cheer is upon us, and it’s so cold let’s warm up with some hot square dancing! 7:30PM Introduction to Contra and Square Dancing for beginners. Dance at 8pm. By Donation. All welcome, no experience necessary. This IS a family-friendly event! Bring your own water bottle or cup so we don’t have to do dishes! We will also be holding an open tune session as well at 5pm in the Old Town Hall. Click on the image to download a poster…and pass it on!